No exception: Minister for commerce and industry Anand Sharma. New Delhi/Hyderabad: Indian banks that have more than half their share capital owned by foreign investors will continue to be covered by the new foreign direct investment (FDI) guidelines introduced by the government in February, possibly restricting their ability to open branches and invest in other ventures. 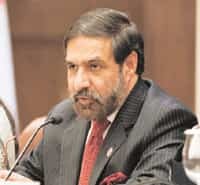 Commerce and industry minister Anand Sharma told Mint on 25 September in Hyderabad that the new policy is “so far working well", implicitly brushing aside suggestions that banks should be exempt from the new rules. “If there are any issues, the inter-ministerial group can look into it. But, at this stage, it is too early to make any judgmental evaluation of the policy," Sharma said. Department of industrial policy and promotion (DIPP) officials had earlier indicated that banks would be kept outside the ambit of the new rules as they are regulated by the Reserve Bank of India (RBI), which has its own policy on foreign banks. Sharma’s statement puts this possibility to rest. Insurance firms are exempt from the new guidelines. In a series of three press notes earlier this year, the department had introduced far-reaching changes in the way foreign investment in a domestic company is calculated. They are significant because India imposes caps on FDI in several sectors such as banking, insurance and telecom. RBI had pointed out earlier this year that the guidelines will create a new category of “foreign-owned and Indian-controlled banks", which could pose regulatory challenges. So far, there have been only Indian banks and foreign banks, and separate rules on priority sector lending and market access are applied for the two categories. Under these guidelines, RBI said, seven private sector banks—ICICI Bank Ltd, HDFC Bank Ltd, Yes Bank Ltd, IndusInd Bank Ltd, Federal Bank Ltd, ING Vysya Bank Ltd and Development Credit Bank Ltd (DCB)—could be categorized as foreign-owned because foreign investment in such institutions exceeds 50%. Mint had reported this development on 13 May. ICICI Bank has approached DIPP seeking a clarification on the issue. The bank said that because its management is controlled by Indians, it should be considered an Indian-owned company. Sharma denied knowledge of concerns raised by ICICI Bank. “If there are issues between the ministries, those can be discussed. So far, to the best of my knowledge, no such concern (of ICICI Bank) has been conveyed to us by the ministry of finance. Policies are meant for the country to serve national interests. Policies evolve with the changing times and are never frozen," he added. Both ICICI Bank and HDFC Bank declined to comment. An ING Vysya Bank spokesperson said the bank is awaiting more clarity on the issue. Data from the Bombay Stock Exchange shows that foreign investment in DCB is 30.77%, though under the new rules, some of the domestic investors in the bank may be reclassified as foreign. However, an official at one of the seven private banks said under condition of anonymity that the bank is not too worried as “banks are governed by the RBI guidelines". Apart from the impact of the new FDI guidelines on the banking sector, there are two other key issues that analysts think needed clarification. One is how trusts should be dealt with and the other is the impact on sensitive sectors. A senior DIPP official, who did not want to be named, said FDI will not be allowed in a trust unless it is registered with stock market regulator Securities and Exchange Board of India (Sebi). However, as venture capital funds, which usually have a trust structure, are not regulated by Sebi, FDI in such entities will be regulated through the Foreign Exchange Management Act that sets rules on foreign exchange transactions by Indian citizens and companies. However, the official conceded that though there is no clarity on indirect foreign investment in prohibited sectors such as multi-brand retail and gambling, the department does not think there is need to clarify the issue as there is “general understanding among the investors and consultants that government would not allow such investments". The central bank had pointed out that the new guidelines could lead to the formation of “shell" companies, whose sole intention would be to make downstream investment in sectors with FDI restrictions, or with sectoral caps. Analysts say such ad hoc measures should not be adopted when it comes to foreign investment policies. “There are many grey areas in the FDI policy which need to be clarified as investors are still in confusion. It is not fair to assume that analysts understand certain limitations. They are all waiting for clarity," said Akash Gupt, executive director at audit and consulting firm PricewaterhouseCoopers. Anita Bhoir in Mumbai contributed to this story.